CoinCrack Review - Are you sure you want to buy it? 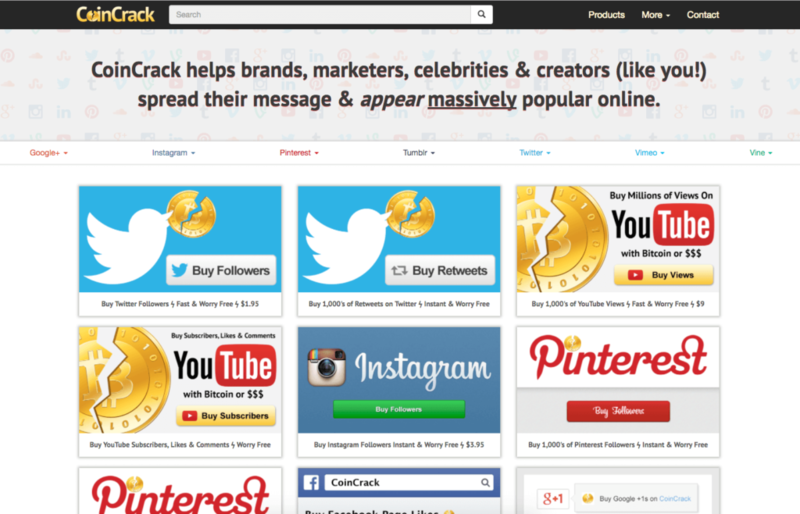 CoinCrack is one of the more affordable social media boosting provider out there today. 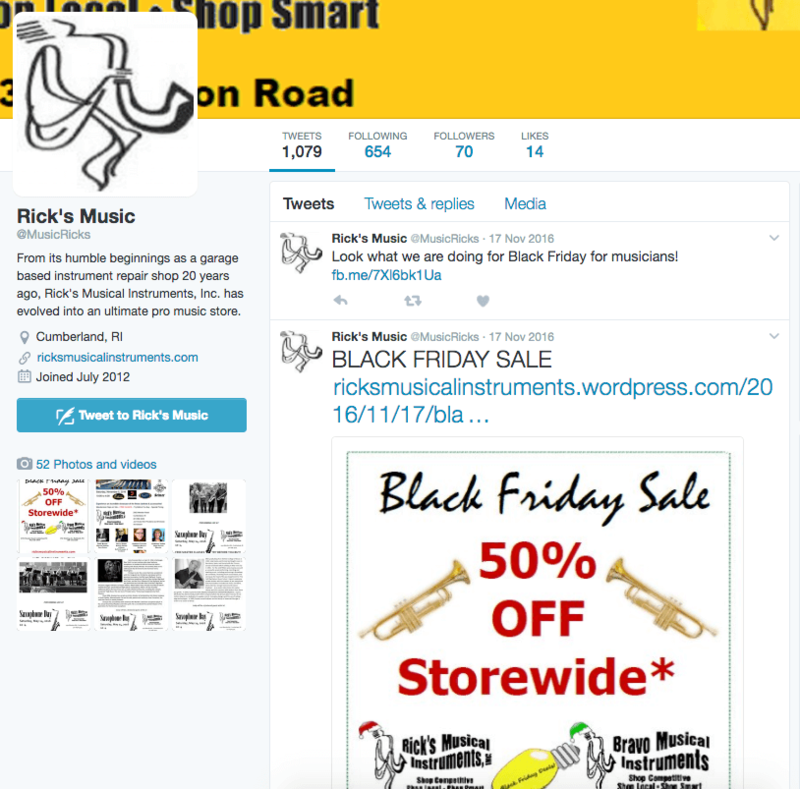 Given their pricing, lower quality followers are to be expected – you get what you paid for. 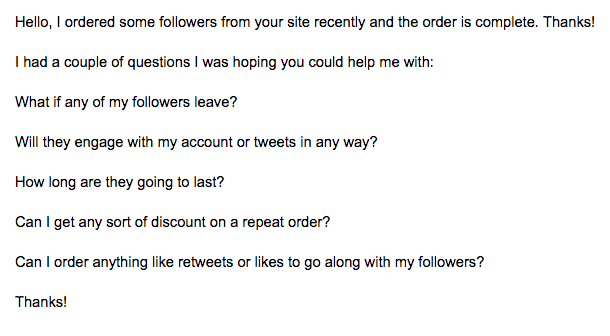 They offer very speedy delivery – we started receiving followers within two minutes of placing an order. CoinCrack’s customer support team was also responsive and replied to our inquiries the same day. CoinCrack is a company that is composed of entrepreneurs, bloggers, designers and social media gurus. Established in 2013, this company sought to provide affordable yet dependable social media boosting services for individuals and brands alike. 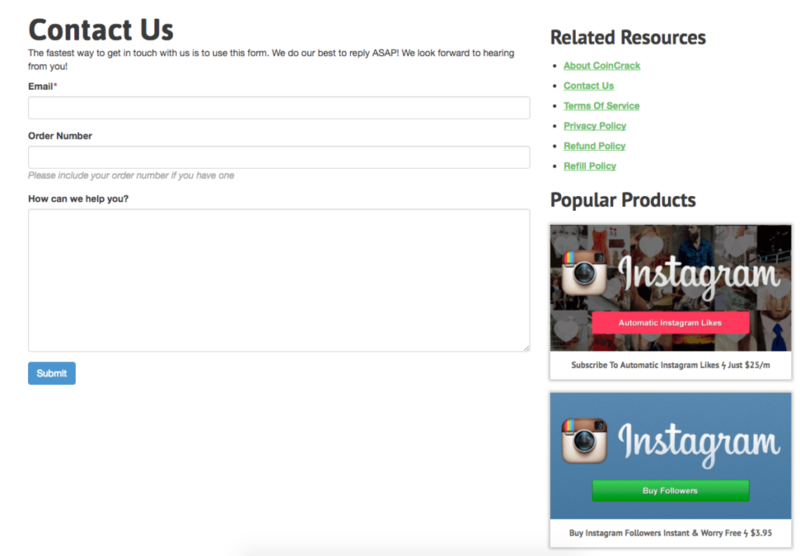 They offer social media services for platforms such as Twitter, Pinterest, Facebook, Tumblr and more. This company is known for their lightning fast delivery and affordable prices – these are things that definitely make them a standout in today’s market. CoinCrack’s website is animated and flashy – to say the least. When you get there, you’ll instantly see the services they offer on the top nav bar. Their services are also tiled up on the homepage, which can be distracting and confusing, but if you use the top nav bar you’ll be OK. The website contained a good amount of information that answered most of the questions we had. Overall, it took us some time to get used to their website. We found that some of the functions on the homepage were redundant and confusing. If you ever find yourself on their website, trust us and just stick with the top nav bar. CoinCrack offers several plans for social media networks. Click through to see their current packages along with the prices for each one. 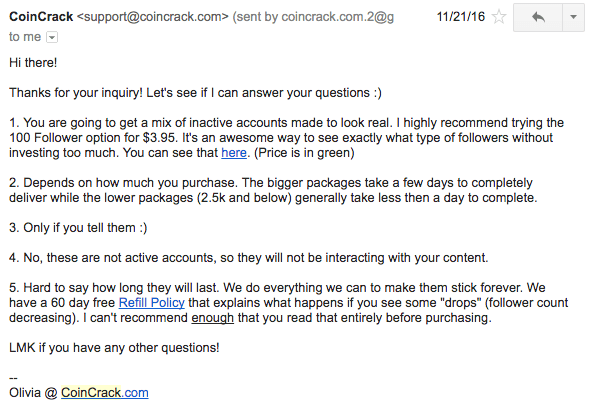 CoinCrack’s Refill Policy guarantees any followers, likes, or views you buy for 60 days. This means that if your numbers drop, you can contact CoinCrack and they’ll refill the order ASAP. According to their Refund Policy, if CoinCrack is unable to deliver their service as promised you can get a full or partial refund. You can reach CoinCrack’s customer support team through the on-page contact form on their website. We placed some pre-purchasing inquiries to put their responsiveness to the test. After ordering, we sent another inquiry with some more questions. Once again, their response was excellent, answering all of our concerns and providing some links to more resources. Our order with CoinCrack went pretty much as expected. We got our followers very fast and for cheap, though they were fairly low quality. Customer support was very responsive and helpful. Overall, they delivered exactly what they promised. Check out the results for yourself at our test account: @BradTippsy. The turnaround time for our 1,000 Twitter followers was extremely fast. CoinCrack offers “Lightning Fast Same Day Delivery,” and that’s exactly what we saw. They didn’t come in at a very organic rate, though this isn’t what CoinCrack promised, so we can’t fault them on that. The overall quality of the service was good. We received a total of 1,322 followers - 322 more than we ordered. Those extra followers are good insurance in case any unfollow later. 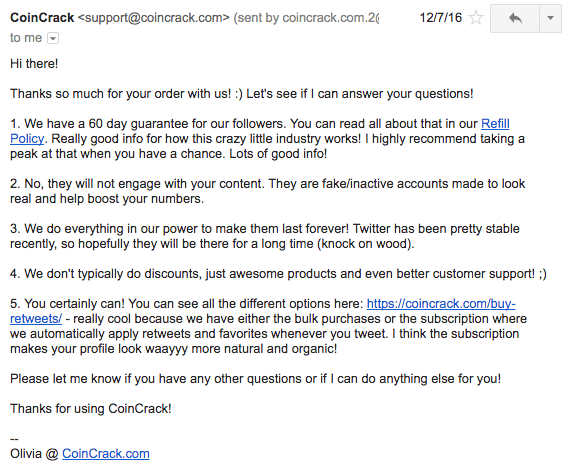 CoinCrack is very upfront about the quality of the followers - they will be fake. 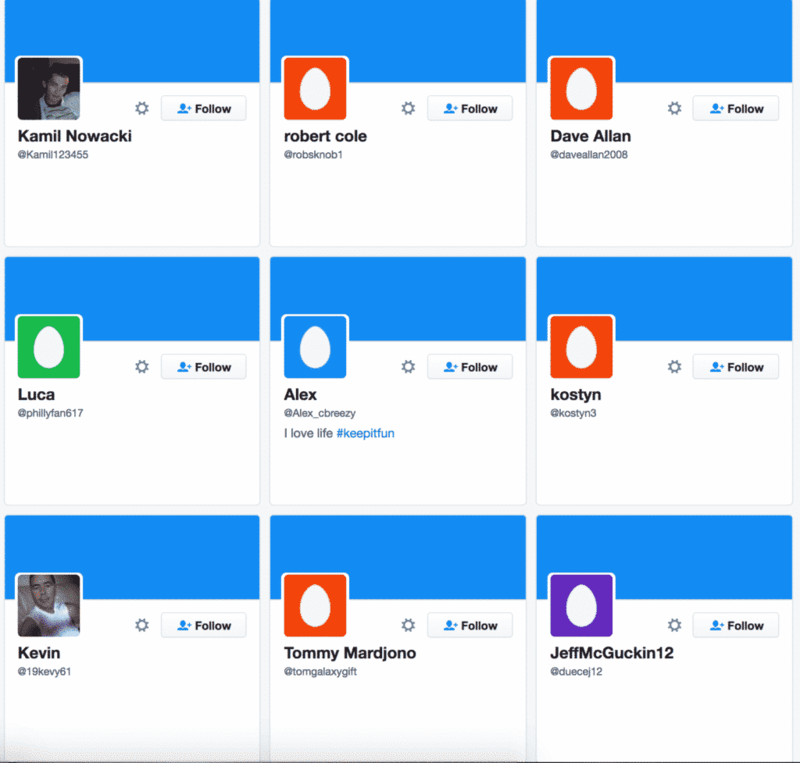 You can see how many of them are non-English have eggs instead of profile pics, and no bios. Some of the accounts are a few years old, while others are just a month or two old. Most of them are inactive, or have never tweeted. There were a few NSFW followers. 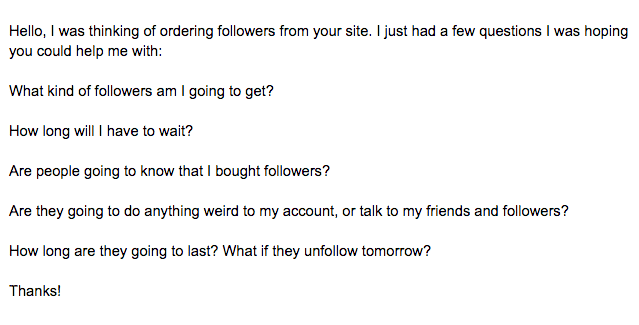 If you buy followers but they don’t stick around very long, you just wasted your money. You need those followers to stay with you if they’re going to count. As of this review, we still have 1,127 Twitter followers. We lost some, but we’re still well above the 1,000 we ordered. CoinCrack provided their service as promised. They don’t deliver the highest quality social media services, but the price is appropriate. Customer service is top-notch, one of the most important aspects to look for in a company like this. If you have any problems, you can be sure that they’ll help you sort them out. 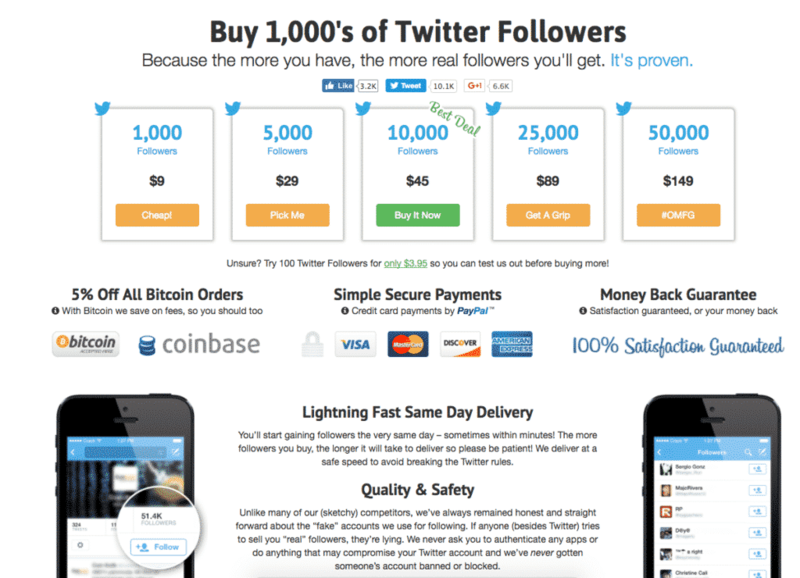 CoinCrack offers affordable Twitter followers that are delivered to you in lightning speed. Given their low prices, it’s to be expected that they won’t look just like normal Twitter users. This might be one of the best providers for anyone looking to build up their following fast, without spending a ton of money. Your followers will look fake, but they’ll still help you gain authority and grow an organic following. 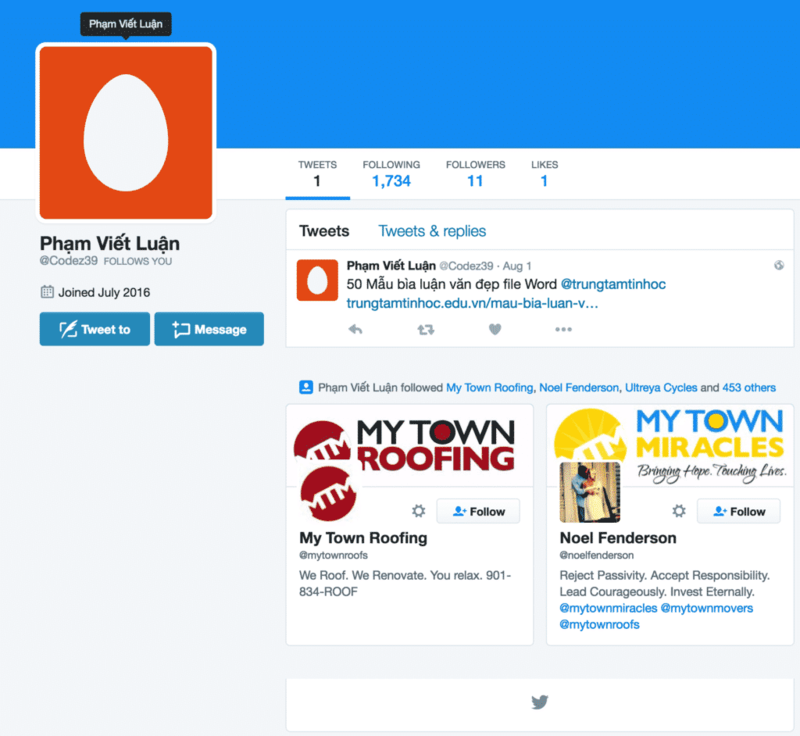 Close investigation of these followers will make it obvious that they are bought, so keep that in mind. If you want to buy followers who will look more like real Twitter users, you’ll have to pay a bit more and go with providers such as those found at the top of our Twitter follower provider list. However, if you just want to gain a more impressive follower count, CoinCrack is a good provider to choose. You’ll probably get more than what you paid for as this company is not afraid to over-deliver. Q: Is CoinCrack a legitimate company? Yes, CoinCrack is a legitimate company that will provide the services they offer. Q: How long has CoinCrack been around? CoinCrack has been around since 2013. Q: Do I need to give CoinCrack my account password? Q: How long does CoinCrack take to deliver? The turnaround time is generally extremely fast, often starting within minutes and finishing within a day. Q: What guarantees does CoinCrack offer? CoinCrack offers a Money-Back Guarantee and a 30-Day Satisfaction Guarantee. If your order can’t be completed for some reason, you can get your money back with no problem. Or, if you have a problem, they’ll do their best to help fix it. Q: How is CoinCracks’s customer service? CoinCrack has excellent customer service. They responded very fast, and were very helpful. Q: What social media networks does CoinCrack offer services for? CoinCrack provides boosting services for Facebook, Google+, Twitter, Instagram, YouTube, SoundCloud, Pinterest, Vimeo, Tumblr, and LinkedIn. Q: What payment methods does CoinCrack accept? CoinCrack accepts most major credit cards, and cryptocurrency with a 10% discount. Q: Is this service anonymous? Will people know I bought followers? This is an anonymous service, and there will be no direct evidence that you bought followers.